This recipe for The Best Homemade Chicken Pot Pie pot pies, so you can do one meat and one veggie, or you can make one and freeze the other for later! In a large pot, add butter, potatoes carrots, onion, celery and garlic. Sauté until tender. Stir in flour until blended. Gradually add broth.Bring to a boil. Cook and stir for 2 minutes or until thickened. Stir in peas, 1/2 cup cream, parsley, garlic salt and pepper. Stir in chicken. Spoon into two ungreased 9 in pie plates. In a small bowl, whisk egg and 1 Tbsp or cream, set aside. Roll out the pastry to fit the top of each pie. Place over filling and trim, seal and flute edges. Cut slits in pasty to vent. Brush top of pies with egg mixture. Bake at 375 for 30-35 minutes or until golden. Let stand for 10 mins before cutting. NOTE: You can bake both pies, or cover and freeze one potpie for up to 3 months. 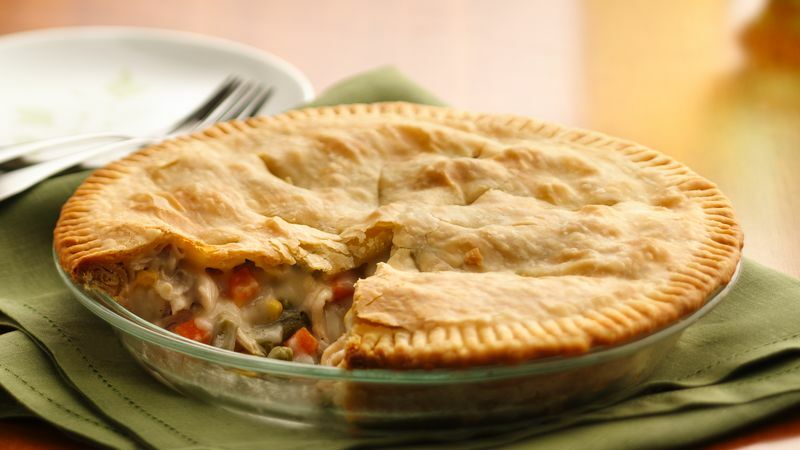 To use frozen potpie, remove from the freezer 30 minutes before baking. Cover pie loosely with foil. Place on a baking sheet. Pre heat oven to 375-degree F and bake until lightly browned and bubbly, about 40 to 45 minutes. Oven times will vary.